With 15,000 seats, there are 41 rows of bleachers looking down on a playing field that is below ground level.? ?Major facelift 2005 includes a video scoreboard. 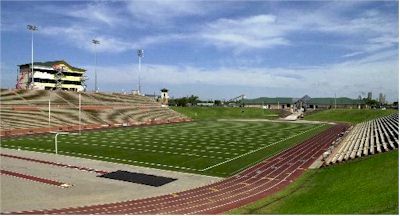 Opened in 1950, the Amarillo Independent School District performed a major update to the stadium infrastructure in 2004-2005. Improvements included: multi-level state-of-the art press box with VIP suites, WI-FI Internet, closed circuit video instant replay, 2 galley kitchens, private rest rooms, full radio broadcast, television broadcast and coaches suites for both home and visitor teams.